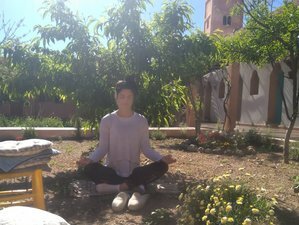 If you're looking for a place in Morocco that teaches traditional martial arts and meditation and embraces Chinese culture, Koom's Farm & Training Center in the Atlas Mountain completes your search. The Training Center is searching for individuals who not only will enjoy training martial arts but can also demonstrate their strong dedication to understanding and preserving the arts. In this program, Master Sham and Koom Retreat Center will enable you to learn about internal Martial arts, Moroccan culture, and spirituality as well as herbal plants and sustainable farming. External Martial Arts are to break & destroy, Internal ones are to develop and heal. You will learn both. Mind, Body, and Spirit all need nourishment. Koom Retreat Center features spring drinkable water and, on top of being a retreat center and a training academy, is also a farm. They plant olives, pumpkins, fava beans, figs, peaches, citrus, oranges, lemons and more. That makes it the perfect spot to train. The academy also provides students with tableware, bedding, washing machine, and wireless internet. Participants will stay in private single rooms which are bright and located within the school. The private cozy rooms are equipped with a dresser and a study desk, simple and neat. Bathrooms are shared and equipped with Western bathrooms and 24/7 hot water. Each room offers one single bed, wardrobe, as well as table and chair. Surrounded by the majestic and deeply spiritual High Atlas mountain range, Koom Retreat and Training Center offers you every opportunity to learn Kung Fu and expand your horizons. Koom is a Shaolin martial institution authorized to receive and teach the internal martial art of Xing Yi in Africa. The curriculum of Koom's academy includes several known fist forms in China including Shaolin fist, Xing Yi, and Sanda. Apart from those styles, students in the academy may learn a high-level internal Qi Gong - kinkong ligong. All the fist forms and the Qi Gong come from their original birthplaces and their pure inheritors, embodying their conventional feature in teaching and learning. One of the oldest forms of martial arts in Chinese Kung Fu is the Xing Yi Quan. It started in the southern Song Dynasty 10 centuries ago. Xing Yi Quan’s theories and scientifically-accepted precepts are founded on a comprehensive and sound school of thought. The Xing Yi Quan masters have knowledge and skills of various forms of Kung Fu that have originated from different people. The name, Xing Yi fist, was founded by Guo Yunshen who is credited for refining the art of fighting. He is regarded for modernizing it to include the five major constituents: metal, wood, water, fire, and earth. This is also known as Wu Xing in Chinese lingo and is similar to the five forms of Xing Yi fist including chopping, Beng, Zuan, Pao, and Heng fist. The associated theories inspired the Xing Yi fist and accompanying weaponry, and the whole concept is based on contemporary Chinese doctrine. Overall, there are other twelve imitative techniques that are based on the movements of the following animals: the dragon, tiger, horse, cork, pear, sparrow, hawk, monkey, eagle, swallow, crane, cat, and snake. Aggressive and direct, Xing Yi is one of the few boxing arts known to have been used in preparation for organized warfare. Its emphasis on straightforward practicality was combined with enough subtlety to earn a reputation as one of the original Chinese internal martial arts. %Xing Yi is a rare traditional and cultural treasure of the Chinese nation. The charm of martial arts is due to its deep cultural connotation. Now, Chinese martial arts have been spreading across the world with the development of the globalization. If you want to practice martial arts well, you must understand martial arts morality. Only those who possess excellent moral characters can have a positive heart and a clearer, broader, and more unselfish mind. They are capable of abandoning all distracting thoughts and external disturbances to practice hard and focus on exploring the essence of martial arts. Thus upholding martial arts and advocating morality is regarded as the basic principle of the academy as well as the characteristic of operations. All the students studying at Koom will first be unified by the great cultural value, regardless of nationality, ethnicity, or origin. Koom offers free optional traditional Moroccan cultural lessons here in the evening from Monday to Friday. After the students finished the afternoon training, you can choose to attend according to your interest. The available classes are Arabic (classic and Moroccan), writing workshops, sustainable farming and medicinal herb studies, and massages. There will be a school certificate given upon completion of the training. Students often ask about the kind of preparation they should make before coming to the academy. At Koom, they place a high priority on physical preparations before arrival. This is done by practicing healthy dieting, long distance running, swimming, sprinting, Ping-Pong, sit-ups, cycling, and other forms of exercise before your arrival. All forms of stamina training are good as they help students learn the martial arts easier. All sports that help your body build muscle and get stronger are recommended, as are sports that help increase your aerobic ability. If you'd like to attend training at the academy, please send inquiry. You will need to provide proof of travel health insurance. You will need to provide a statement from your doctor confirming your aptitude to train here with Koom. Come in the best shape possible to make the best out of your stay. Koom offers instructions to beginner students with no or limited martial arts experiences to gain more skills through martial arts training. They welcome participants who are healthy mentally and physically. The training plan is also very flexible according to students' different needs. There are courses of different lengths that span from one month or less to five years. The student's ages range from 21 to 70 years old because what they teach is suitable for all ages to learn. There is no maximum of age to come, but there is a minimum of it. For kids, it is better to come with a parent. Each year, they have family groups to come here to train with their kids together. Younger students of less than 16 years old are accepted if they are accompanied by their parent or older relatives particularly a brother or a sister. Ensuring there is good quality teaching, every master is supposed to manage seven students in the winter and less than 15 students in the summer. This will ensure high-quality martial arts training on a personal level and assure a close family atmosphere in the group. In Koom's training hall, there is a set of fitness training equipment, power training equipment, mats, pads, punching bag, and gloves that are provided during the training. You can also buy your own one if you want during your training. During the winter, students can practice in the facility's warm temperature as they offer heating. The presence of a translator in the academy is also good as it facilitates smooth running of activities. In order to better inherit the teachings you are about to acquire, Koom requests that masters and translators give special care to foreign participants who came a long way to Morocco from home and may encounter many differences. When this happens, all masters and translators are their relatives who are happy to help them and accomplish their training schedule. At Koom, there is a mutual respect between masters and students, making this school a harmonious training and living environment. There are strict rules in the academy to help participants attain more disciplines and focus on training to improve themselves. Koom trains all week-long from Monday to Friday. The training starts at 6:00 a.m. It is advisable for students to wake up earlier in the morning so that you can get fresh air breathing along the farm to walk or run. During the week from Monday to Friday, it is better for students to sleep before ten at night so as they are able to recover energy to study the following day. During the weekends, there are master and translators on duty. Questions about training can be asked at any time in a normal class. There is free time for everyone other than the kitchen staff on weekends. Every Friday afternoon, you can go explore a new space to discover such as museums, cafes, scenic places, garden, stores, and luxurious guesthouses as part of exploring the beautiful region of Marrakech. This training will take place at Koom Retreat Center. Koom is located in the beautiful climate of Sidi Abdallah Ghiat (20 kilometers from Marrakech), Morocco. The village hosts every Sunday the best-served farmers' market of the entire region. The farm is surrounded by luxurious properties with restaurants, cafes, and hammams (Moroccan sauna), mini golf, and more. The village has extremely affordable grill houses. Sidi Abdallah Ghiat is renowned for its blend of old rural Morocco and outstanding natural beauty. During the training, you will have daily halal breakfast, lunch, and dinner with vegetarian, vegan, and gluten-free options. The Moroccan food served is delicious and Koom Retreat and Training Center accommodates all dietary restrictions. Breakfast: 7 a.m. to 8 a.m. Please book your flight to arrive at Marrakesh Menara Airport (RAK). Transfer from and to the airport is included. Koom Retreat and Training Center will pick you up from the airport. Koom Retreat and Training Center offers transfers from and to Marrakech CTM bus station with no additional cost. Koom Retreat and Training Center offers transfers from and to Marrakech train station with no additional cost. Airport: Marrakesh Menara Airport Airport transfer included: Marrakesh Menara Airport No additional charges. You can request this in the next step.